El punto de cadeneta es principalmente un punto de borde o contorno, que son los que se emplean para delinear las figuras que deseamos bordar. 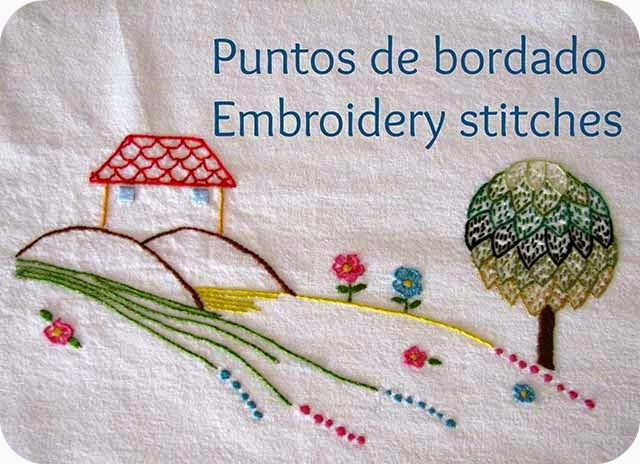 Chain stitch is mainly an edge or outline stitch, which are used to delineate the figures we want to embroider. Colocando el hilo como en el esquema, introducimos la aguja en la tela a través de la cadena anterior y manteniendo la distancia de puntada, la sacamos dentro del "círculo" que hemos formado con el hilo previamente. Se cose de izquierda a derecha, con un hilo suave y no enroscado. Y el mejor método para hacerlo es el de punzada (meter la aguja de arriba a abajo de la tela con la mano que tenemos colocada sobre la tela y volver a sacarla hacia arriba con la mano que tenemos bajo la tela). Placing the thread as in the drawing, push the needle through the fabric across the previous chain and keeping the stitch distance, pull it inside the "circle" formed with the thread before. 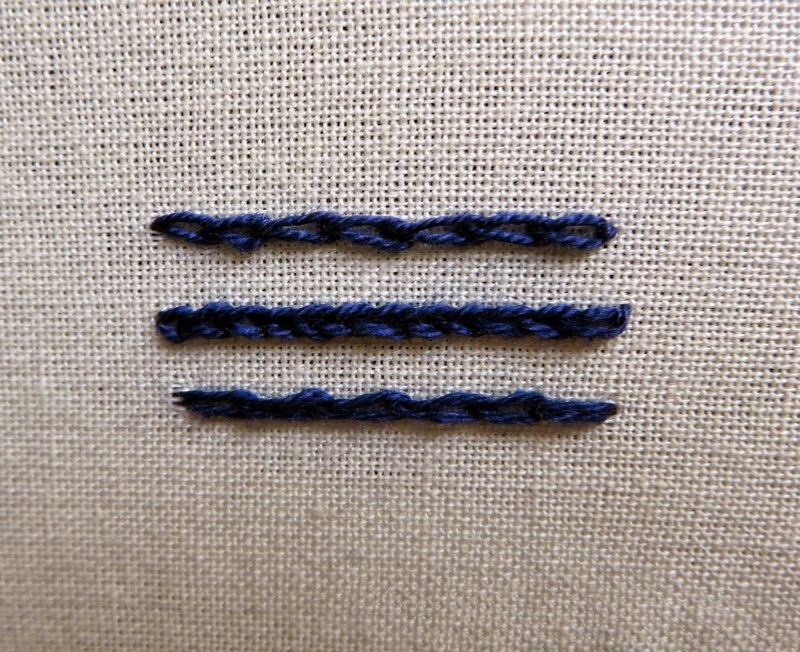 Sew from left to right, with a soft and not twisted thread. 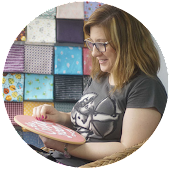 And the best way to do it is the prick (to put the needle from up to down of the fabric with the hand we have on the fabric and to pull it up with the hand we have under the fabric). Se puede emplear en rectas y curvas, pero también sirve como punto de relleno haciendo líneas muy juntas. Cuanto más cortas sean las puntadas y más estrechas las cadenas, más relieve obtendremos. Para modificar el ancho de las cadenas hay que estirar más o menos el hilo. 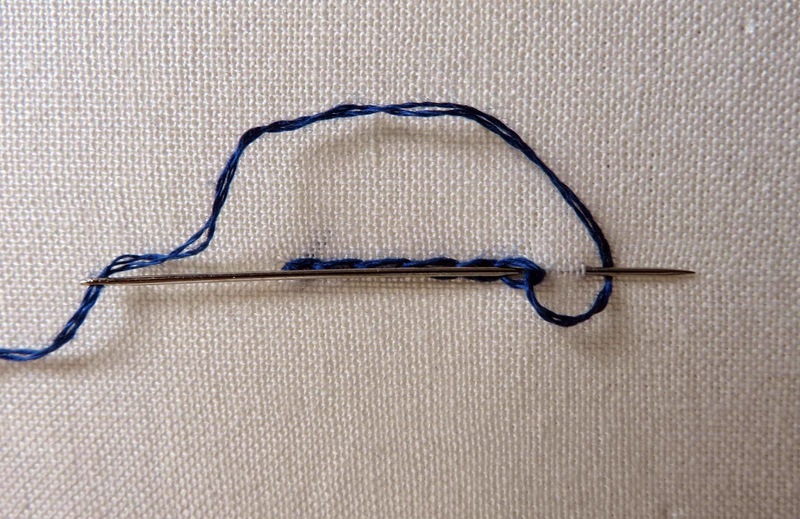 It can be used in straight lines and curves, but it’s also useful as filling stitches making very tight lines. The shorter are the stitches and the narrower the chains, the more relief we will get. 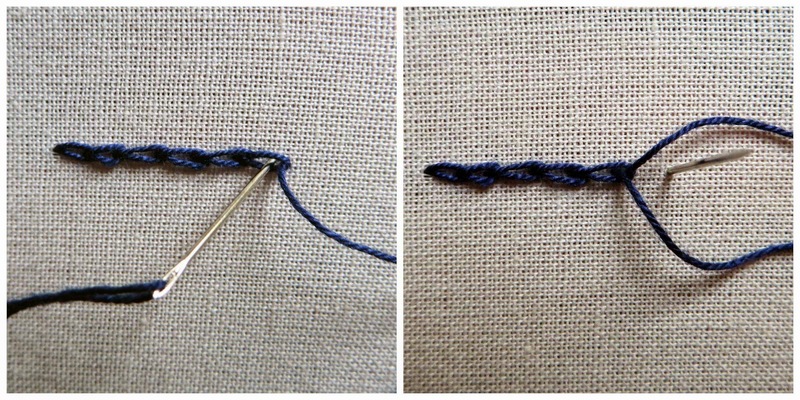 To change the width of the chains just stretch the thread more or less.